Today I am joining Gollum for Foodie Fri.and Suzy at Kitchen Bouquets for Flashback Friday. First for Flashback..A birthday cake for my dear friend Debbie at Mountain Breaths. 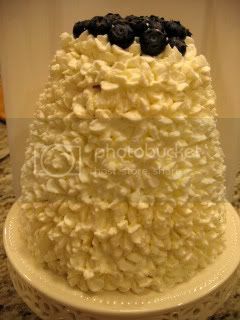 It's a milestone for her, and best wishes as well as this blueberry filled whipped cream cake is sent her way! Blow out the candle and make a wish, Debbie! Many healthy returns!! 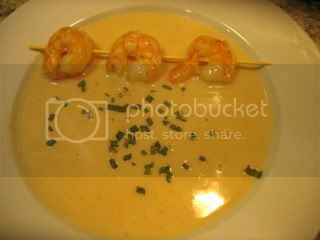 And for Foodie Friday I share this,,,Shrimp Bisque.. I am tweaking the recipe, and it's not there yet..so when I get it the way I want it, I will share it..
Save those shells from the shrimp, you need them to make the stock.. Anyone else having problems with Photobucket?? ?...I started this post this morning, but PB was being difficult! That's a great birthday cake. I have all kinds of problems with Photobucket. I wish somebody would help me figure out some of that stuff. But I'm sure it's me, not them. Or maybe it is them. Kathleen ... gorgeous looking cake. 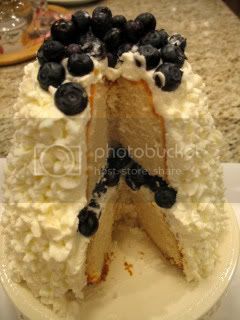 Love the idea of blueberries in between the layers. What a great Flashback and sentiment! Beautiful cake Kathleen..thanks for joining me! Enjoy the time with the kids and call in for Pizza so that you can enjoy your family. The cake looks delicious, Kathleen!! I am wondering how you frosted it the way it looks...a certain piping thingie?? I would love to see what you come up with for the shrimp bisque. My husband had Lobster Bisque in Vegas and he has tried to top it by ordering and evaluating everywhere we go. He has also tried crab and shrimp bisque but is SO fussy. I'd love to try a recipe to knock his socks off with!! lol!! Now, that cake is gorgeous. Thanks for sharing. We're sharing peanut butter ideas and Elvis stories at diningwithdebbie.blogspot.com. I hope you will come join us. Or, join us for Crock Pot Wednesdays. Mister Linky will be ready for that on Tuesday. Happy Birthday, Debbie! That's a great looking cake. Mile high for a milestone? Enjoy the weekend, you definitely have beach weather! Cool cake! I would love a special cake like that. Looks delicious. Great birthday cake and the scrimps also look delishous. They are a favoriete food of mine. 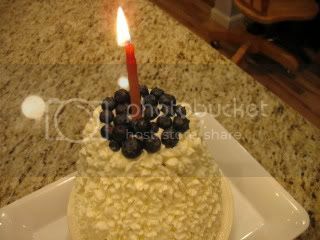 I've used many a blueberry in the past week myself ;) What a lovely birthday cake and wishes for Debbie. Kathleen, that's a beautiful cake for Debbie. Happy B'day, D! What a fabulous cake! Blueberries and whipped cream! Yum! That's a very tall, and very wonderful cake! Thank you sooooo much for the birthday wishes!